Some of our clients operate out of the Washington, DC metro-area and you can’t visit DC without making a stop at Georgetown Cupcake . Now this is a brand that takes merchandise to a whole new level. 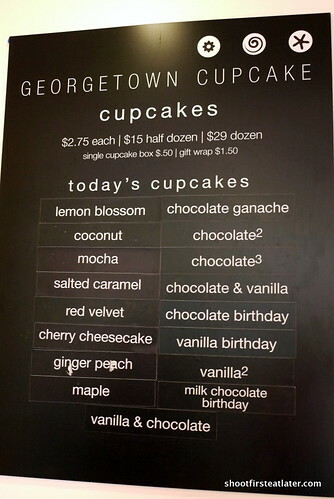 Georgetown Cupcake recently launched into the national spotlight when TLC sniffed out their story and offered to produce a reality TV show, at the height of the cupcake crazy that is, literally, sweeping the nation. But long before their cable debut, this brand’s creative take on applying their brand to merchandise helped them secure the edge on the local cupcake market. 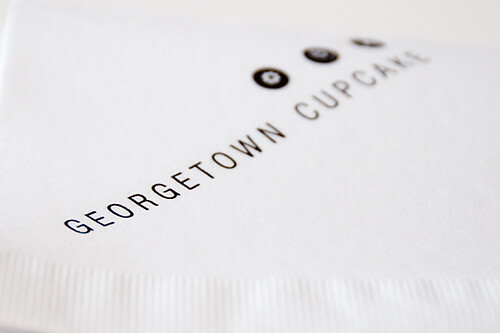 The Georgetown Cupcake logo has all the elements of a strong, memorable and scalable mark. The logo appears on everything, from T-shirts and menus, to napkins and awnings, this logo looks great in all applications. Our favorite part about this logo is seeing the flower, swirl and star icons translate to the cupcakes themselves. 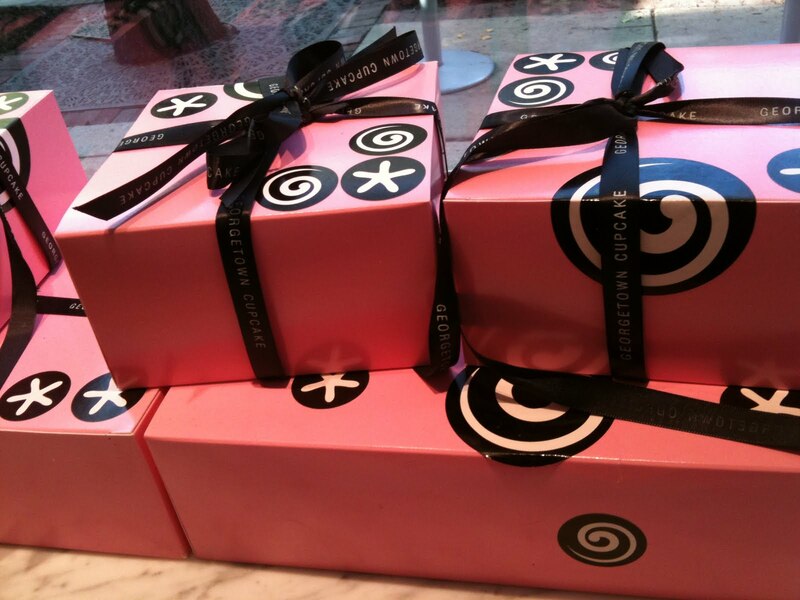 The owners compliment the straight-forward black and white design with a splash of pink, especially notable in the use of the “pink box” that holds your cupcake. While it may be true in the merchandising world that the most popular colored box belongs to Tiffany’s, talk a walk down M Street in Georgetown and pink is the box getting all the attention. The swirl, the star, and the flower icons are on everything that comes out of the store. And when you see those images, you know that a sweet treat made with excellence is on the way. This is an excellent example of how a strong brand, a versatile logo, and a creative look and feel can propel a product to the top of the market place. Can we honestly credit excellence in brand marketing to the company’s success? We think so. Don’t believe us? Lets just say that on on end of M St, there is always a line out the door and a 30-45 minute wait for Georgetown Cupcakes while at the other end, cupcake competitor Sprinkles rarely even has a line.